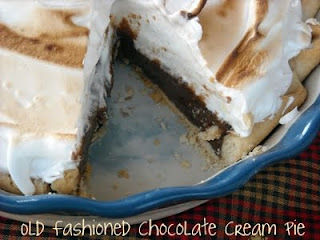 A few years ago I attended a potluck Christmas party and tasted a delicious chocolate pie. I'm not kidding you, I thought of this pie often. I've tried a pudding pie recipe before that used Jello pudding mix, but it wasn't the same. Last week, I came across this recipe on Mommy's Kitchen and decided to try it. It was a cinch to prepare and it tasted so good! I didn't even make the meringue topping, and it still tasted wonderful. I suggest you make this and dare you to control yourself from sneaking your fork into the refrigerator for a bite. *picture from Tina at Mommy's Kitchen, none of mine turned out very good! Preheat Oven to 350. Prick the bottom and sides of your pie crust and bake until golden brown. Remove from oven and let cool while you prepare the filling. Mix the sugar, cornstarch and cocoa together in a medium size pot. Add the 2 cups evaporated milk or whole milk. If using evaporated milk I use a 12 oz can, measure one cup evaporated milk add to the pot and then measure one more cup evaporated milk, you will be a bit short it comes to more like 3/4 cup so fill the rest of the measuring cup with whole milk to make a cup. Using a wire whisk blend together and stir constantly over medium high heat. When the mixture is heated through add the 3 egg yolks. You will need to temper you egg yolks so add some of the pudding mixture to the egg yolks and blend before adding to the pudding mix. Stir constantly until thickened and bubbly. Remove from heat and add the vanilla and the butter. Let pudding mixture cool while you prepare the meringue topping. To make the meringue topping mix the 3 egg whites with a dash of cream of tarter along with 2 Tablespoons sugar. Whip the egg whites till stiff and soft peaks form. Add pudding to cooled pie shell and top with meringue making sure the meringue touches the sides of the pie crust to prevent shrinking. OR use Meringue Powder to prepare topping. Follow directions on container. Broil till lightly golden brown on top. *I actually lost my directions to my meringue powder, so I didn't do the topping. I topped each slice of pie with cool whip, and it tasted great!